Home » ROOT » It’s beginning to look a lot like Christmas! A busy house full of guests and noise can be very stressful for animals, and all those tempting decorations and foods can pose significant risks. 1. If you’re hosting celebrations, exercise pets before your guests arrive. This will help them de-stress and make them more likely to nap once the festivities are underway. 2. Create a safe, quiet place for your pet to relax away from the party. Even the most social creatures need a break sometimes. It may also help to play music or leave the TV on to mask the chatter of visitors. 3. Don’t give in to those puppy dog eyes. Christmas food includes some of the most dangerous foods for animals to consume. Festive foods can be fatal, so don’t give in to those pleading looks! Particularly, do not let your pets anywhere near alcohol, avocado, chocolate, Christmas pudding, coffee, cooked bones, currants, fruit cake, grapes, gravy, ham, lollies, macadamia nuts, marinades, onion, pork, raisins or sugarless gum. Of course, some pets can be very crafty when it comes to plotting ways to obtain special treats, so keep an eye out for any changes in appearance or behaviour (including poor breathing, excessive panting, poor breathing, muscle twitching, vomiting and diarrhoea). If you think your pet has eaten something they shouldn’t have, please take them to the local vet as soon as possible. 4. Keep Christmas decorations out of reach. A dog may think the baubles hanging from the tree look conveniently like toys or tennis balls – but if a plastic or glass ornament breaks in their mouth, it could cause serious damage. Edible decorations like candy canes can also pose a risk. It’s best to hang anything risky near the top of the tree. 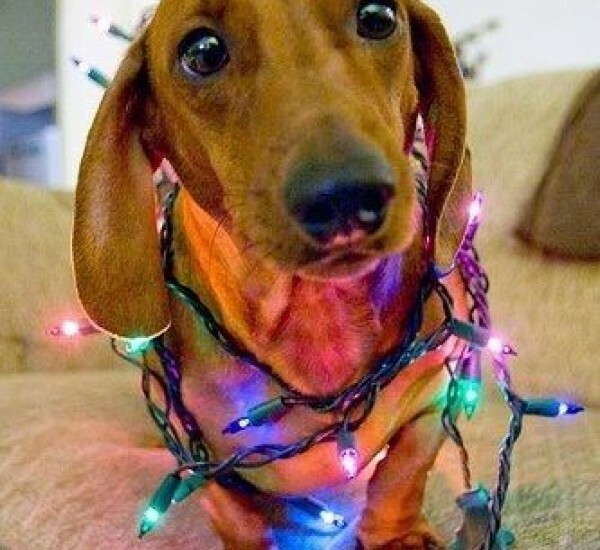 If your dachshund is fascinated by the tinsel or tree lights, keep an eye on these too, to avoid the risk of choking or electric shock. 5. Clean up wrapping paper quickly after presents have been opened. If chewed, wrapping paper and ribbons can prove dangerous for a pet’s intestines. 6. Don’t forget to give your pet a special Christmas treat! Your pet needn’t miss out on all the festive cheer - you can have some fun with this one. You could create a treasure hunt of dry food or treats around the house or yard, make some yummy treats, or take some time to play their favourite games with them. Thanks to RSPCA for their original post.